The big news this past fortnight was that Matey(8), graduated from the Kings Swimming program to their swimming squad. A huge effort which was rewarded with a big graduation ceremony. 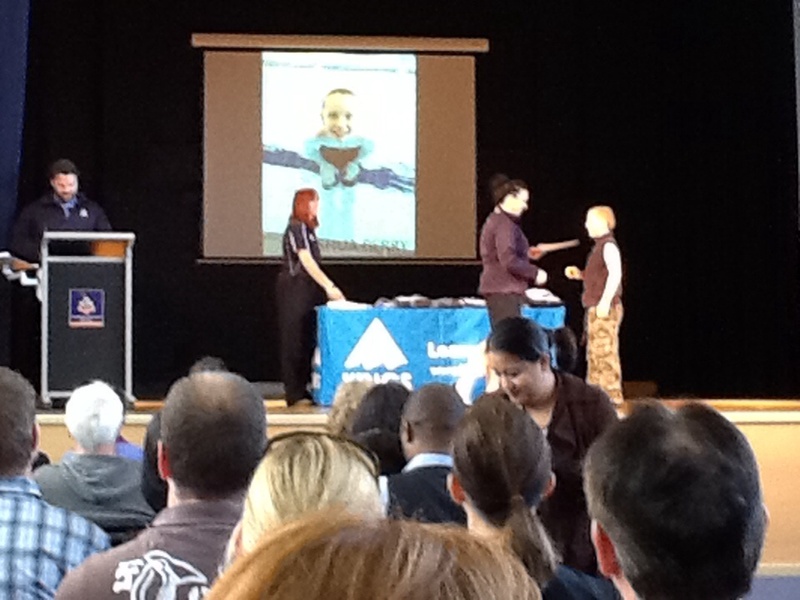 He was the third youngest swimmer to graduate this year and he has done a great job. Due to his current ability and age, his swimming teacher says that he will go far if he has the competitive spirit within him over the next few years. He is proficient in all strokes and is really pushed each week to beat his personal best in all strokes. The swimming squad he will join commences in October so we will then be at the pool numerous times each week as both children are in different squads. Summer school holidays in January will not be a break as they have training five days per week then. At the moment they both enjoy it and it is great fitness training. School Holidays: At the moment in Victoria, Australia, it is currently school holidays. We follow the school terms and take a break from “schooling” over the school holidays but I do have a holiday points system that I implement. I print off a chart where they colour in how many points they obtain for doing certain ‘tasks’ and when they reach 200 points, they then get an item of clothing, a book, toy or money worth $15. The tasks include reciting times tables, playing board games, watching an educational DVD, reading, science experiments, washing windows, cooking a new recipe etc. The kids really get into it and end up doing a nice lot of educational activities throughout the holidays. Reading: Princess (11) commented how she was already half way through her grade 6 maths books and if she finished the rest of the grade 6 maths this year (as she is in year 5), then she wouldn’t have to do any maths next year. Not a wise thing to say to me. My immediate reaction was to fetch the book “The Brainy Bunch” by Kip and Mona Lisa Harding about a family with 10 children in America who all commence college by the time they are 12 years old. Please hear me correctly – I am not wanting that for my daughter. What I am wanting though, is for her to be a self starter and to be able to push/extend herself a bit. Her homework was then to read this book (which she quite enjoyed!!). In keeping with the theme of extending her, I am compiling a list of classical books I want her to read by the end of the year and in the following two years. So far she has read “Oliver Twist” by Charles Dickens and then both kids watched the movie. “The Tale of Two Cities” by Charles Dickens has begun and the movie has been half watched although this is not as easy as “Oliver Twist”. DVD’s: I am not a huge fan of allowing my children too much screen time but last week when I was shopping in Target with. Matey, we came across a number of DVD’s for $5. “Oliver Twist”, “A Tale of Two Cities”, “The Keys of the Kingdom” (about a priest who goes to China and the effect of his Christian ministry and not bowing to having Christians in name only but real transformation of the heart), plus several others. Along with watching these and several others, namely “Man vs Wild – Bear Grylls”, “China Cry” (based on a true story about Nora Lim) and “The Dreamer”, they have had a lot of screen time this last week. They also watched the Australian movie “The Dish” as we were planning on driving through outback NSW to Queensland (through Parkes where this movie is based) for the school holidays which didn’t end up occurring. They loved this movie and it was quite educational. I loved how they discussed the various aspects so much and really got into the whole theme of watching the first man land on the moon. All movies I would recommend. Europe study: At the end of the term, we had commenced a unit study on Europe. Along with playing various board games and Princess compiling a 44 day European tour throughout every European country, highlighting their capital city and their main tourist features, we also went to a local travel agencies ‘European night’. We were quite upfront about the fact we weren’t booking a trip, just wanting more information, and the photos and film were fantastic. That week we also had the privilege of having Russian missionaries come for afternoon tea and speak to us for several hours, showing photos and films and describing their ministry. The DVD’s we watched during this time were ‘The Sound of Music’ and ‘A Courageous Heart’ – a film about Irena Sendler a Catholic Social Worker during World War 2 who was nominated for a Noble Peace Prize in 2007 (the year Al Gore won for his climate change information but didn’t save any lives like this lady did!!). Mission: We joined up to watch the 13 week series through Frontier USA Mission ‘On the Move’ where they track a family going to different Muslim countries around the world and showing what life is like in the those countries. So far, we have learnt a bit about life in Sudan. TEAR sustainability Week: From October 20-26, TEAR (www.liveononeplanet.com) are encouraging people and families to join up for a week of trying to live sustainably by reducing costs, not driving, only using the food in your pantry etc. We are exploring this idea and being involved as well. A great way to teach the kids about the environment and our effect on it. Halogen Foundation: Earlier this year, we took the kids to the National Young Leaders Day in Melbourne. Every year this organisation run a day in most Australian capital cities for both Secondary and Primary students. The Secondary School Leaders days are coming up in November and parents of teenagers, I encourage you to take your teens. The input they receive is so valuable. Jessica Watson is one of the guest speakers at the Melbourne event. The primary students day is next March (Friday 13th March 2015 in Melbourne and 23rd March in Sydney). Bindi Irwin is one of the guest speakers for the primary event. We took both Princess and Matey earlier this year and Matey was only 8 years old but he loved it and found it inspiring. I believe that if we are raising children to impact the world, why not take advantage of opportunities like this. For more information, go to www.halogenfoundation.org I am registering both children now so that I can take advantage of the early registration offer.